Chile is a major exporter of apples to other Latin American and Asian countries. Some of these countries do not have populations of the codling moth and they want to keep the insect out. 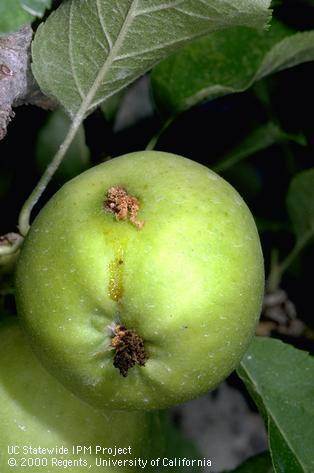 Codling moth is present in Chilean apple orchards which means that growers must spray insecticides to assure that their export fruit shipments will not be rejected. Title: Evaluation of azinphos-methyl resistance and activity of detoxifying enzymes in codling moth (Lepidoptera: Tortricidae) from central Chile. Publication: Journal of Economic Entomology. 2007. 100(2):551-556. Title: Estimating the economic costs and benefits of pesticide use in apples. Publication: Proceedings of the Brighton Crop Protection Conference, Pests and Diseases. 1996. 4B-1:325-330. Farmers in South Korea harvest about 900 million pounds of apples annually. This production is only possible because a large number of fungicide sprays are made to prevent fungal pathogens from rotting the apples. The most common disease of apples in Korea is white rot, a disease that starts on the apple peel, moves toward the core and turns the entire fruit into a soft, watery, pale rotten mess. Title: Development of a spray program for apple with reduced fungicide application in Korea. Publication: Journal of Plant Pathology. 2009. 90(Supplement 2):S2.155. Authors: Lewis, N. and Ruud, J. Title: Apples in the American diet. Publication: Nutrition in Clinical Care. 2004. 7(2): 82-88.